This June we are holding a crab celebration at Rick Stein’s Fish in Falmouth so to get us in the mood we have collected ten top facts about crabs. Let us know your top crab facts in the comments below, or share them with us on Facebook or Twitter. 1. There are more than 4,500 known species of crab found in waters worldwide, 62 different species can be found right here in the UK. 2. The Japanese spider crab has been known to have a leg span of over 4 meters long – that’s about five times the length of the average human leg. 4. The smallest type of crab is the pea crab which only grows to a few millimetres, about the size of a ten pence piece. 5. Think you’ve got the best moves on the dance floor? You might have some competition with crabs who use their dancing skills to attract female partners by flapping their pincers and drumming their claws. 6. Most crabs have flat bodies that enable them to squeeze into very narrow crevices – the exception to this is the hermit crab who use the shells of sea snails as their homes. 7. Humans eat about 1.5 million tons of crab worldwide every year and have been recorded to have been eating crab since pre-historic times. 8. Watching what you eat? Crab meat is very high in vitamin B12 and the stomach-filling protein in crab will keep you full for longer. It also has anti-inflammatory properties and can help lower blood pressure, and protect against heart disease. 9. All crabs have claws on their two front legs – an amazing 9 foot claw span has been recorded on a crab which is longer than the tallest man in the world. 10. Wish you had eyes in the back of your head? Crabs have large compound eyes made up of hundreds of tiny lenses, over 8,000, which means they can look in multiple directions at any time including behind them. 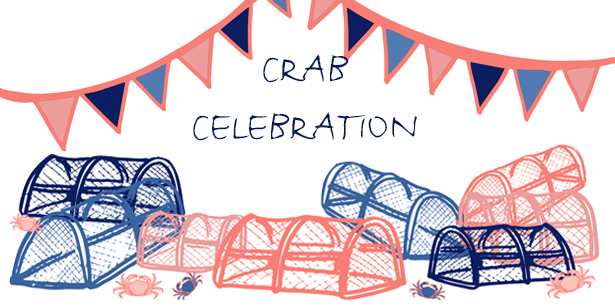 If you love crab, join us this June in Falmouth for our crab celebration!